Keeping a Roman calendar can help you keep pace with the cycles of the year. You can adapt your new 2012 calendar to include some basic dates and festivals from the ancient Roman calendar. 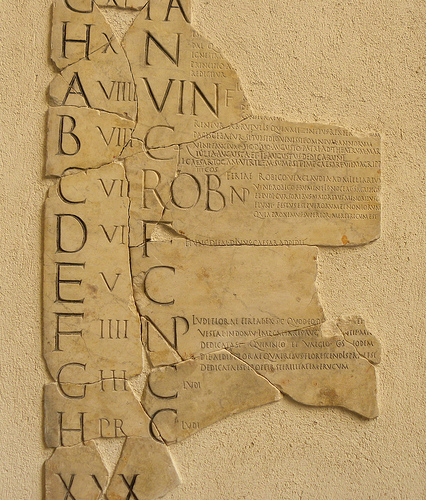 To add a more authentic feel, write in UPPER CASE only, just like on real ancient Roman calendars. A 12 month wall calendar with ample space works best. * Iulius and Augustus were the new names in Imperial times. Use Sextilis and Quinctilis to be authentic to the Republic. The first day of each month, called the "Kalends" is sacred to Iuno, so write "Kalends" on the first of each month. Write the word "Nones" on the 7th day of March, May, July, and October. Write "Nones" on the 5th day of all other months. Write the word "Ides" on the 15th day of March, May, July, and October. Write "Ides" on the 13th day of all other months. The Ides of every month were sacred to Iuppiter (Jupiter), so you can make a note of that too. "Ater" means "unlucky" in Latin. Each day after the Kalends, Nones or Ides is "ater", an unlucky day, so write "Ater" or "Unlucky" on every day after each Kalends, Nones and Ides. January Kalends: Add Ianus to Iuno on this, the first day of the year. January 11th and January 15th: Carmentalia, to the goddess Carmenta. February 13th: Parentalia, in honor of one's deceased parents. March 17th: Liberalia, in honor of Liber, god of agriculture. April 21st: Parilia, in honor of Pales, guardian of shepherds. Also, the founding day of Rome. June 9th: Vestalia. In honor of Vesta, goddess of the hearth. July 6th through 13th: Ludi Apollinares, the "Games of Apollo", in honor of Apollo, patron of music and healing. September 13th: Epulum Iovis, sacred to Iuppiter (Jupiter). October 13th: Fontinalia, a festival to the god Fontus, who gives fresh water. December 17th: Saturnalia . One of the biggest festivals of the year. In honor of Saturn, celebrating ancient days of peace and prosperity. Romans visited their friends and gave gifts on Saturnalia. We posted an earlier version of this guide on WikiHow.